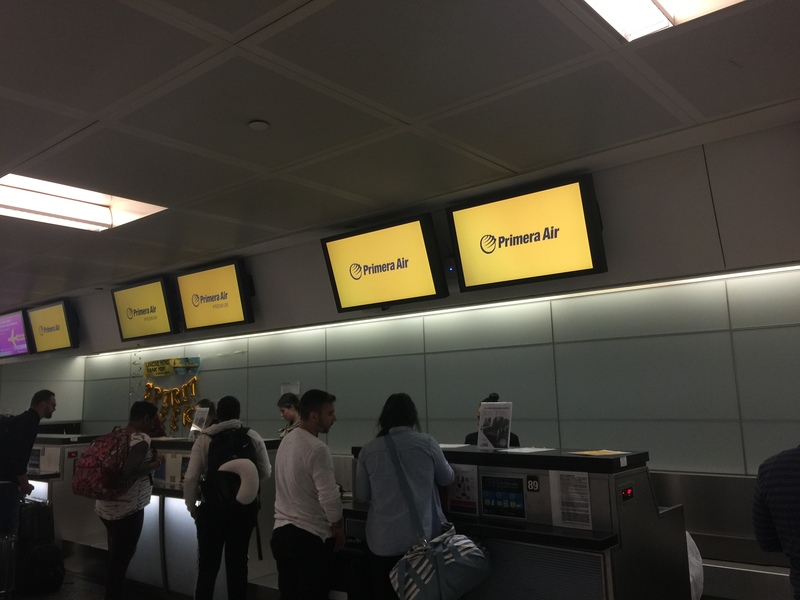 After nearly a decade of intra-European operations, Primera Air decided to enter the low-cost transatlantic realm just last year, dominated at the time by Norwegian Air Shuttle, WOW air and LEVEL. 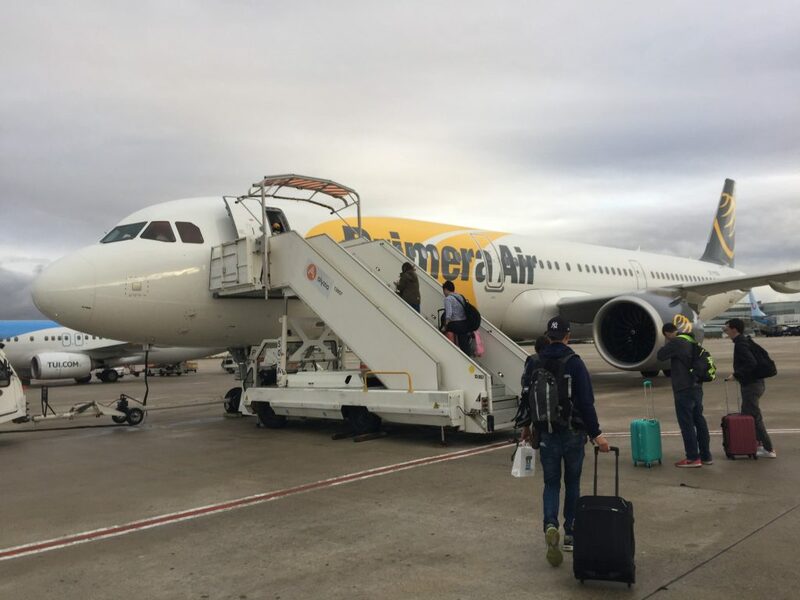 Although each had the same no-frills concept and a business model driven by ancillary fees, the three proved very different in the service offered onboard its flights, Primera is no exception. I flew Primera Air from Newark Liberty International Airport to Paris Charles de Gaulle Airport and back on its brand new Airbus A321neos in both the economy cabin and premium cabin to get a look at what its like to fly transatlantic over 3,000 nautical miles in a narrowbody aircraft on the world’s newest low-cost long-haul airline. 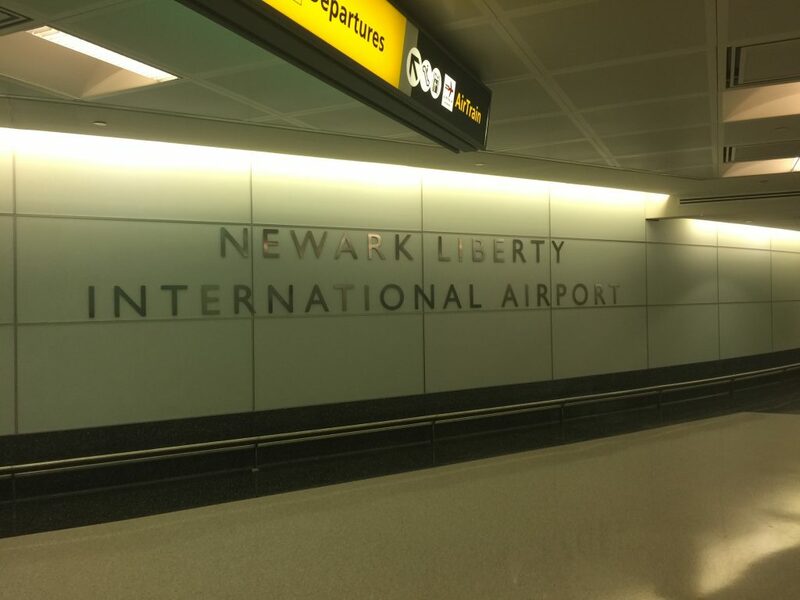 Newark is Primera Air’s current North American stronghold and favorite city as it began its first operations to the city from London in April and has since supplied the aircraft with a steady diet of daily flights and planned future service with its Boeing 737 MAX 9s. Currently, the airline flies from London and Paris daily from the New Jersey airport, serving the greater tri-state area and aimed at connecting New York City and its 8 million residents with Europe at a low cost. I chose the flight from Newark to Paris since I’m a New Yorker and the flight is the third longest in the network, behind the flights from Toronto to Paris and Washington to London. 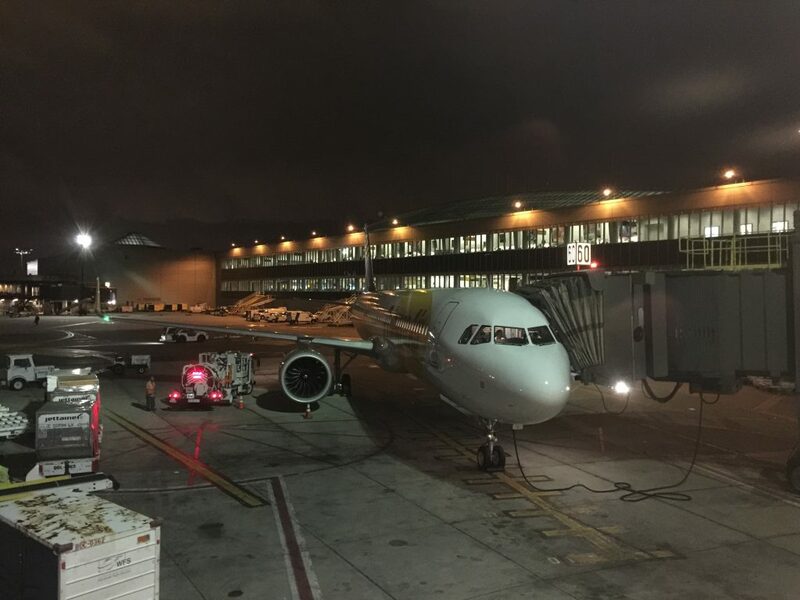 The long flight would give me ample time to familiarize myself with the airline and test whether or not nearly 9 hours on an Airbus A321 would drive me stir crazy, as many of our readers have suggested. With only one daily flight between Newark and the French capital, I didn’t have many options. PF22 operated the outbound leg to Paris. 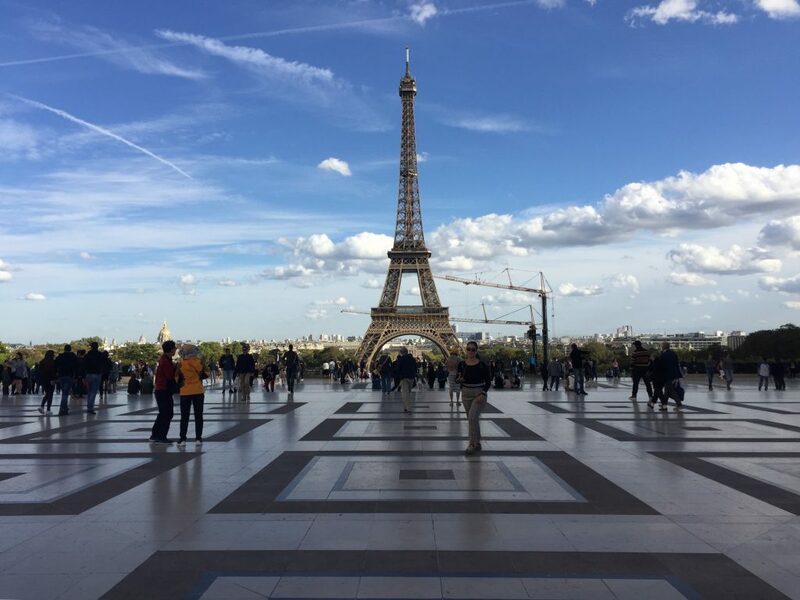 The overnight flight was scheduled to depart at 11:10 p.m. and arrive at Paris’ Charles de Gaulle Airport the next day at 1:35 p.m. 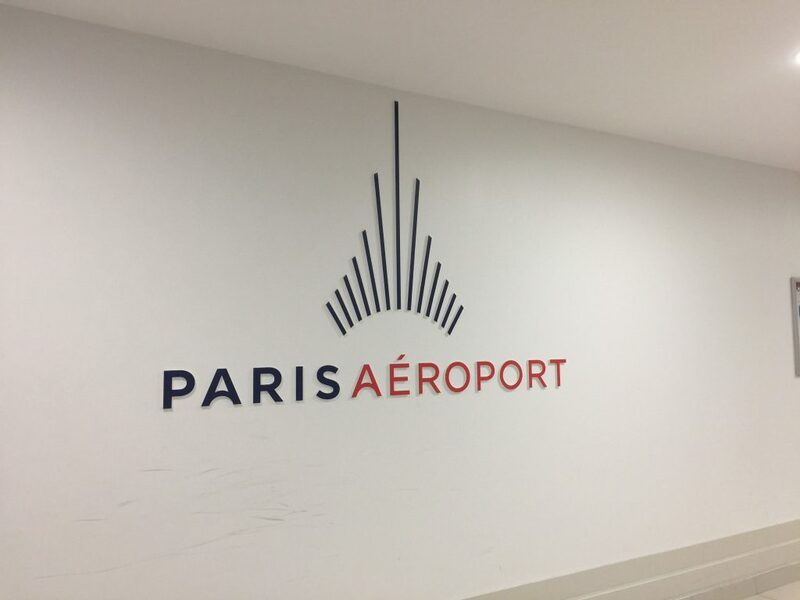 While low-cost airlines tend to avoid the cost of major airports, Primera chose de Gaulle over Orly to serve as its Paris base. This isn’t unprecedented, as Norwegian and WOW both serve the airport, and the airline still managed to save money even with serving Paris’s main international airport, as you’ll see later. 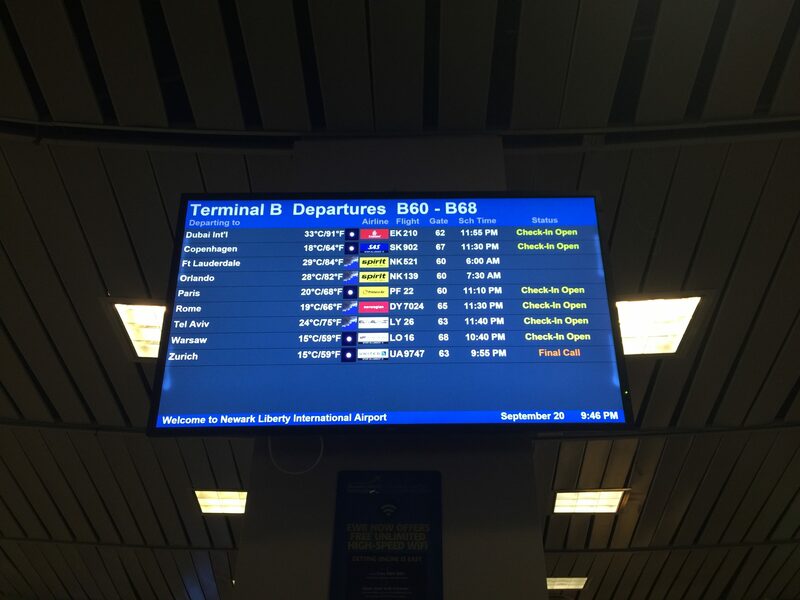 Arriving at Terminal B of New Jersey’s main international airport at 8:30 p.m., 2 hours and 40 minutes before the flight was scheduled to depart, I was quickly reassured that I was early when I saw a non-existent check-in line and 5 Primera check-in desks on the terminals’ Level 1. Since Primera only operates 2 flights from Newark for the time being, I knew check-in wouldn’t take too long. 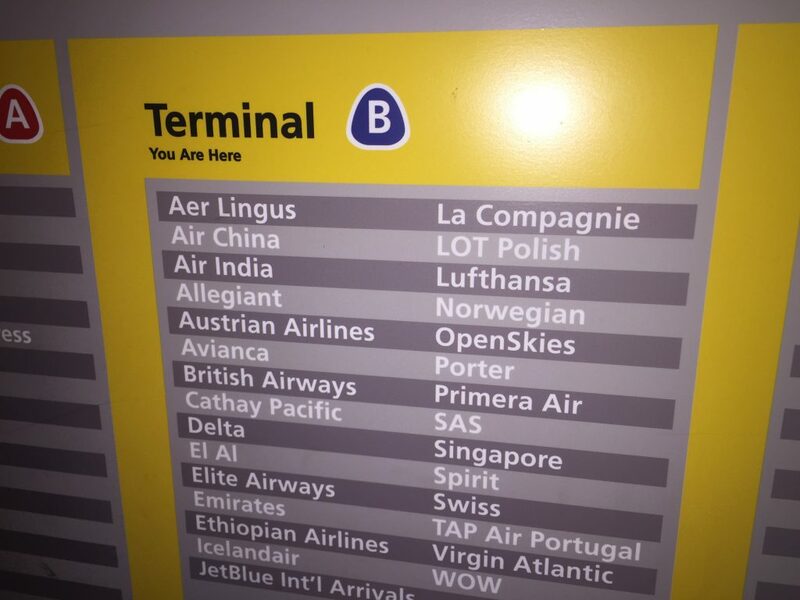 The counter was on the lowest level of the airport, which made finding it from the roadway somewhat difficult as there is little signage to suggest Primera’s location. 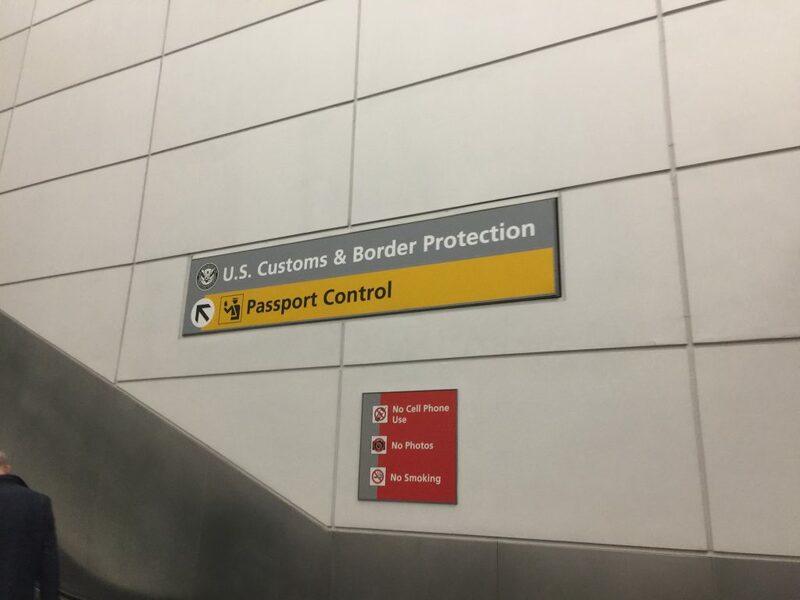 After handing over my passport to the agent and quickly weighing my back to check that its weight was within the limits (10 kilograms ), I was handed my ticket and off I went. I was glad I didn’t have to check my bag, packed with 4 days worth of clothes and books, as I did on Norwegian’s 787 for an overnight trip. 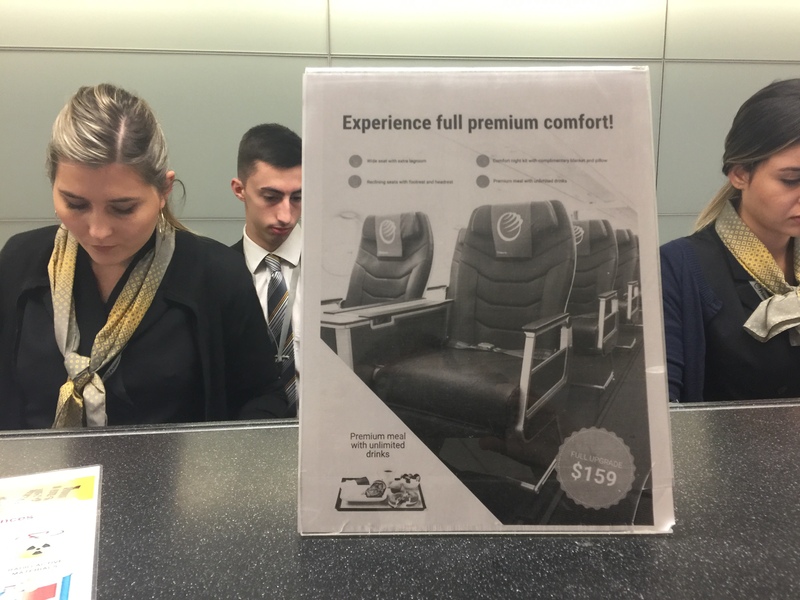 A placard at the counter offered upgrades to the premium class, a low-cost business class cabin aimed at attracting business travelers that want to fly in a premium cabin without spending premium prices on major airlines, for $159. If you purchased a base fare and had a few bags to check, this would undoubtedly be a great deal since you’d get the baggage allowance, a big aisle or window seat, a meal, drinks and snacks, if there’s space available in the cabin. If you were to purchase one of Primera’s $99 tickets, you’d be able to fly in premium for around $260. 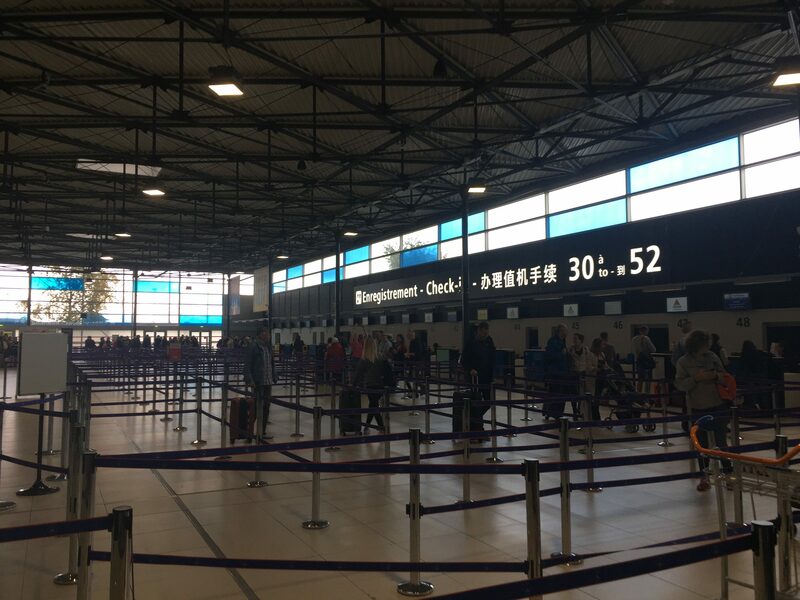 Although check-in was a breeze, Primera finds itself competing with similarly timed flights to cities such as Athens, Tel Aviv and Warsaw, making security checkpoint a time-costly endeavor. Premium passengers, however, got somewhat of a reprieve as they could use the priority line and skip the initial queue. Primera also doesn’t participate in TSA PreCheck so plan on taking your shoes off. Once past security, I had about an hour until boarding. Arriving at the Primera gate, it was unusually bare. No boarding signage informed passengers of where to stand what line to use. 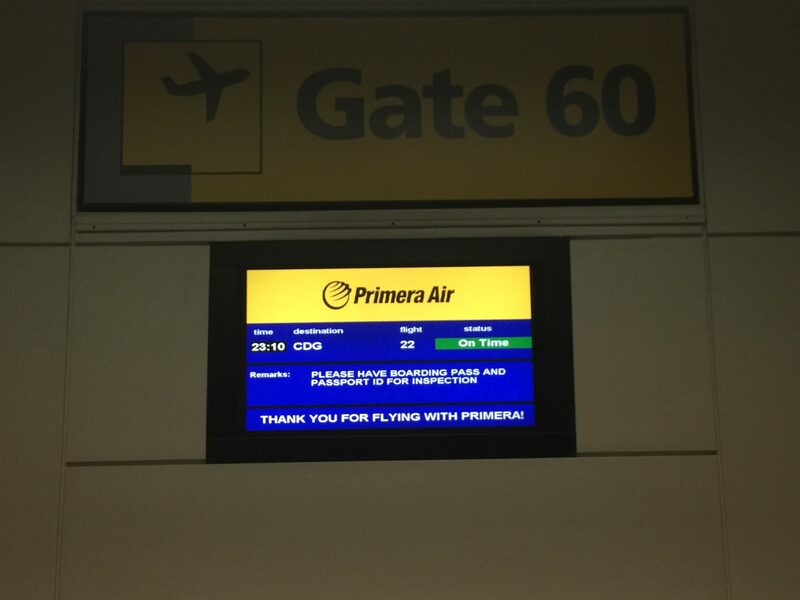 Only the departure screen provided any indication that this was the Primera gate. However, this is one way that the airline saves expenses and keeps fares low. With the crew arriving about 10 minutes before boarding, I knew that we’d be slightly delayed but ended up boarding about 15 minutes post-scheduled time. There was no structured boarding process. Once wheelchairs, pre-boards and premium passengers boarded, the airline invited everybody to board regardless of seat assignment. Although I was happy not to wait, I didn’t expect a free-for-all. Walking onboard the aircraft, modernity was the most evident theme. Dark grey slimline seats with the yellow Primera logo on the headrest showed reflected the basic, yet modern interior. 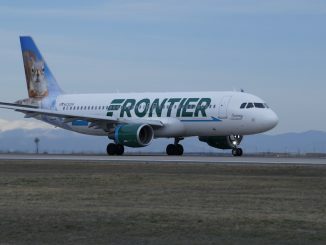 Walking past the 16-seat premium cabin into the economy cabin, I was instantly reminded of Frontier Airlines’ interior as the seat style are near-identical. As I walked back to my seat, 30A in the rear of the plane, I was greeted by the flight’s European cabin crew. I chose seat 30A for a reason, it was in the section of the plane that seat pitch is 30 inches. When looking over the seat map for the flight, I was surprised at how many seating options Primera offered. 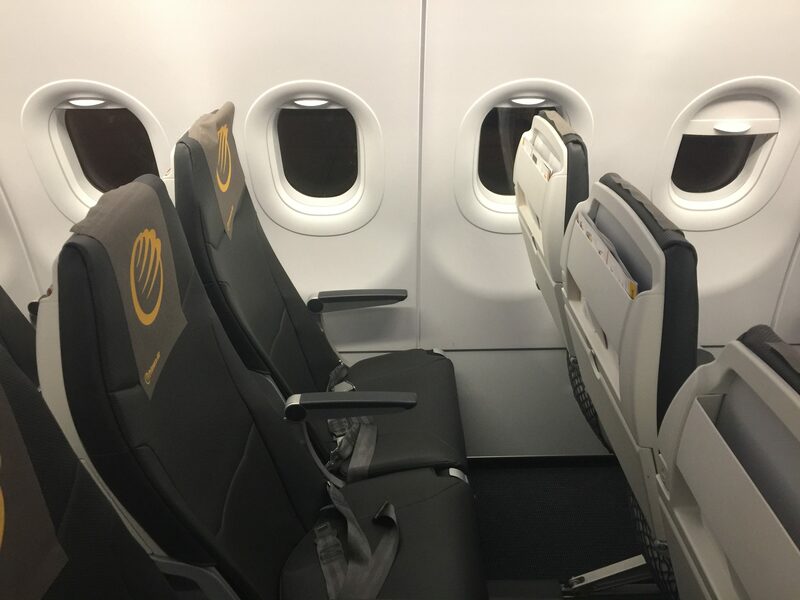 Unlike its rivals, Primera offers seats with 32-inches of pitch in the forward section of economy, 30-inches of pitch in the rear section, as well as exit row and bulkhead seats. The choice is aimed at those both skeptical of 30-inches of pitch, but also those looking to compromise on fares and services yet wanting the traditional 32-inch seat pitch. Many low-cost airlines are one size fits all but the choice is pitch is a good way to attract those who want to pay less and receive less, but also have the legroom they’re used to. It’s almost like Goldilocks where you can choose the seat just right even on a low-cost. On both Norwegian and WOW’s narrowbody aircraft, there was one seat pitch for the cabin, with the exception of exit row and bulkhead seats. I chose the 30 inches of pitch seat to get a feel for the real Primera and see if it would be comfortable for such a long flight. 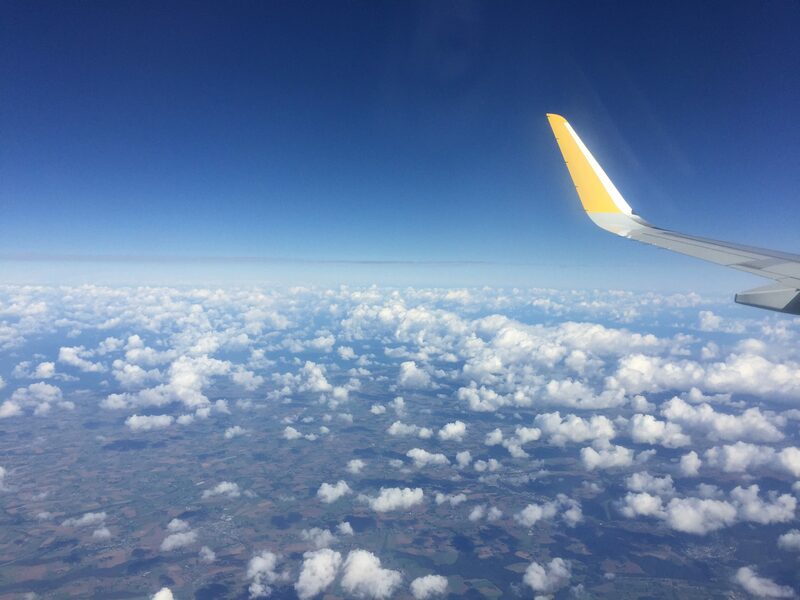 I had flown Norwegian’s Boeing 737 MAX 8 from Dublin to Newburgh and WOW air’s A321 from Reykjavik to New York and wasn’t disappointed, but this flight was much longer. To my surprise and delight, the seat felt incredibly spacious even at 30 inches of pitch. My legs were not touching the seat in front of me thanks to the curvature of the seats and I had ample room to stretch out. I was nervous that the seats would be pre-reclined, as they are on Frontier, but they weren’t and you could recline normally. 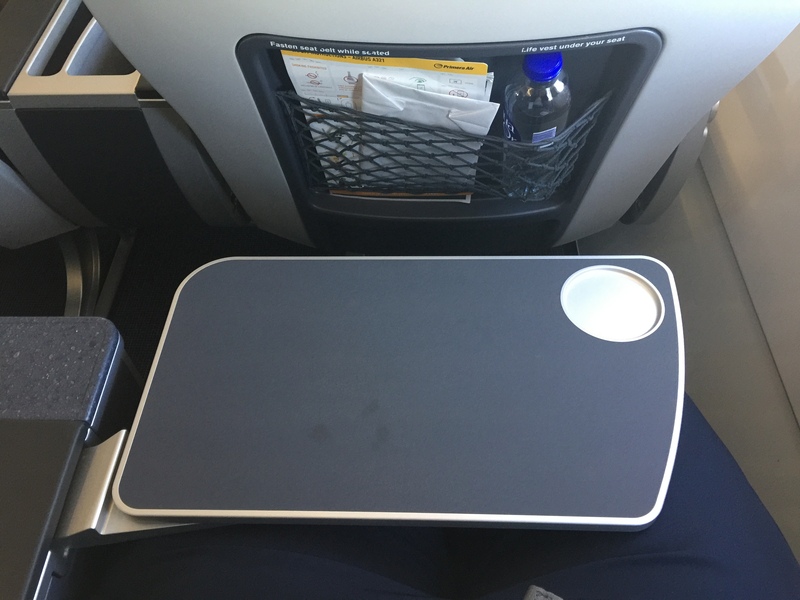 I could even work on my laptop on the half-tray table without propping it up on my stomach as I had to on Norwegian’s MAX 8. Although the seat had minimal padding, I initially found it to be quite comfortable and had no complaints there beyond the non-existent headrest, so I recommend bringing a pillow. 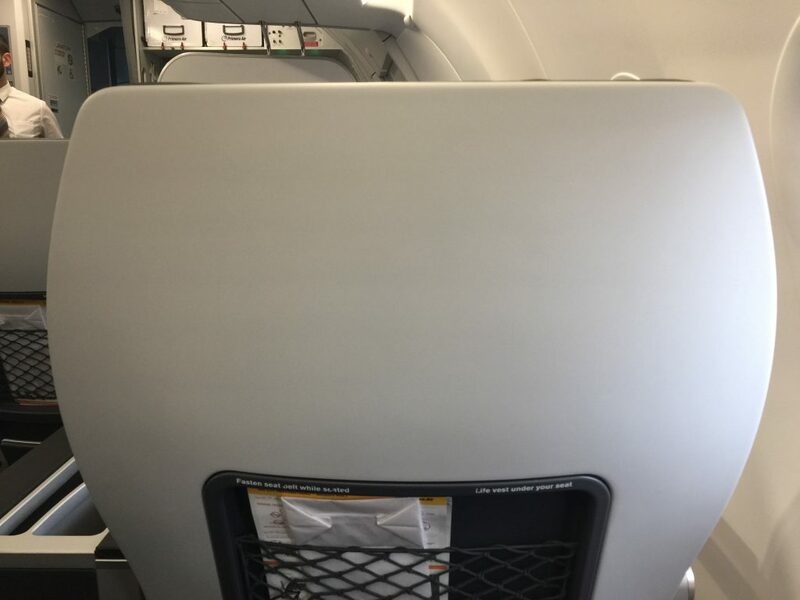 The seatback in front of me also had no padding, making resting your head on it uncomfortable. Additionally, I was surprised by the in-seat power available, as the airline provides a USB port at every seat, conveniently located in the seatback. 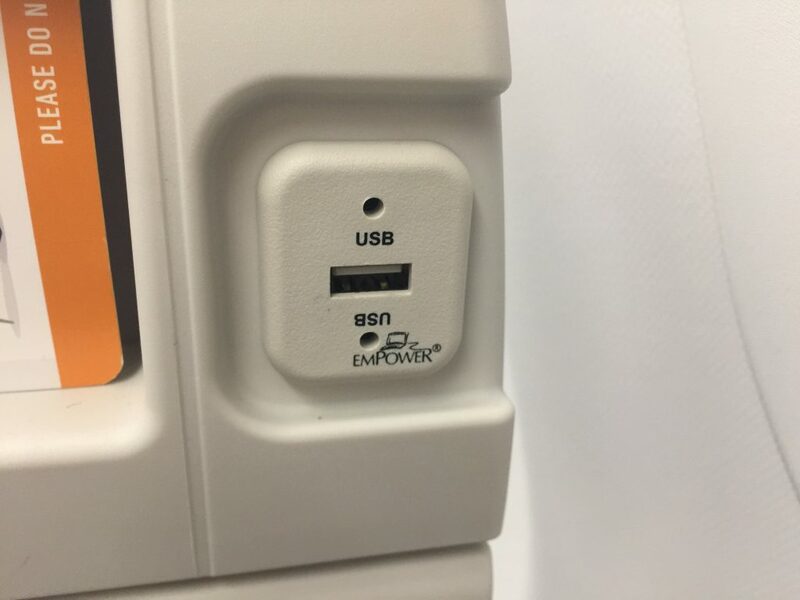 The USB port is critical because the airline doesn’t offer in-flight entertainment, making passengers rely on providing their own entertainment to pass the flight. The charging port allows passengers to keep their phones charged while enjoying their entertainment. Inside the headrest of the forward seatback was the safety card, sick bag and magazine for in-flight purchases. Prices were quite reasonable for the items offered. Primera doesn’t offer complimentary in-flight meals and hot meals must be purchased in advance of the flight on the website. The hot options for this flight were chicken and beef. The airline offers a few choices for meals, including children’s, vegan and kosher, as well as a regular and premium option for the standard meals which is what you’d get in the premium cabin. Following a highly detailed pre-departure announcement from our captain about our route to Paris that evening, it was time to take to the skies. A quick push back and taxi saw us departing Newark on-time 20 minutes after our scheduled departure. Less than 10 minutes after leaving the ground was the seatbelt sign turned off and passengers able to move around the cabin. 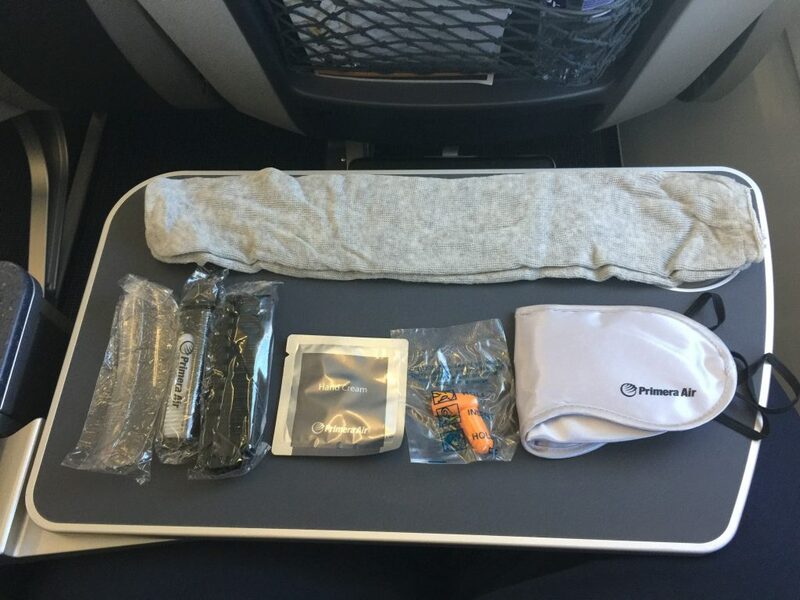 The crew also offered onboard upgrades to premium for 139 euros. A half hour after departure, the in-flight food and drink service began. 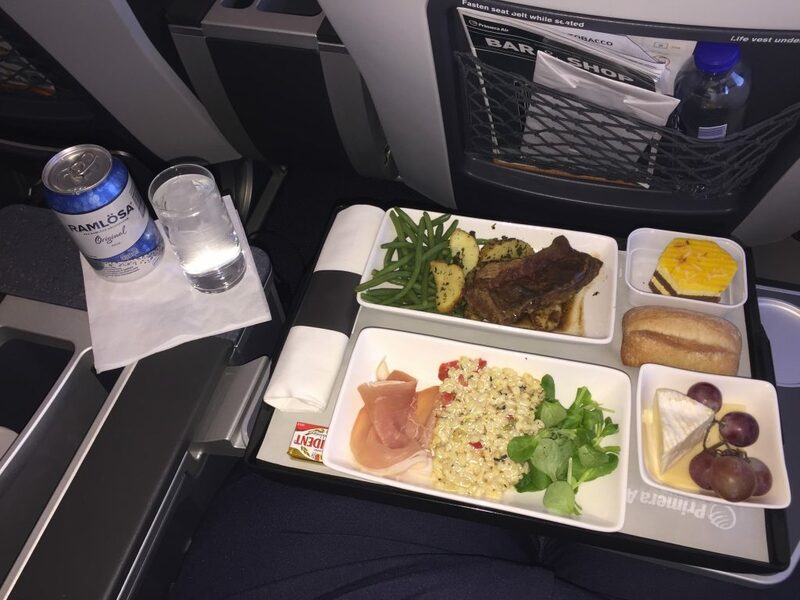 Pre-ordered meals were distributed first by two flight attendants, followed by a sole flight attendant doing the drink service. It took about another half hour for the drink service to reach my seat since there was only one flight attendant handling the cart. As is common on most low-costs, water is complimentary on Primera and coffee and tea are as well. Passengers were also given the opportunity to buy snacks from the cart. If at any point passengers wanted to buy snacks after the initial service, a menu was included in the seatback pocket. Common plane snacks such as Toblerone and Pringles were offered. Once the main service ended, the lights were dimmed and we made our way across the Atlantic. If you got puckish during the flight, however, you could purchase snacks or drinks from the flight attendants at any time. From this point on, there was no more excitement until we reached Europe. The cabin quieted and you could either sleep or provide your own entertainment. If you don’t have something to keep you occupied, you may be bored. After we arrived in European airspace, it was time for the breakfast service. Again, coffee, tea and water were offered complimentary. I fell back asleep by the time the cart had reached my seat but once I was awake the flight attendants came over and asked if I wanted anything, which was great because flight attendants seldom double back after a service. A blueberry muffin was also provided. Touching down at Paris Charles de Gaulle Airport just after 12 noon, the total flight time was around 6-hours and 30-minutes, not bad for an A321. We taxied passed Primera’s low-cost rivals Norwegian and WOW, who use Terminal 1 at de Gaulle, on our way to Terminal 3, de Gaulle’s low-cost terminal. 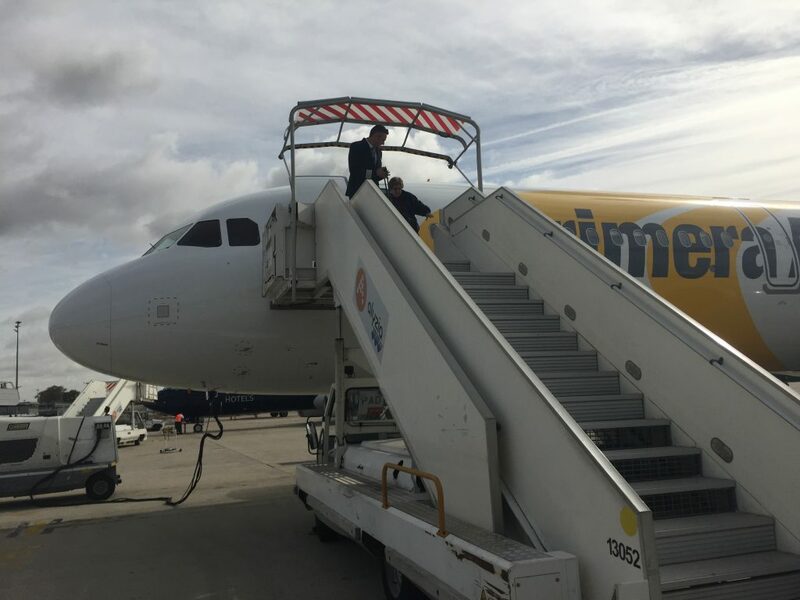 Arriving next to a TUIfly Boeing 737-800, we deplaned via forward airstairs and transited to the terminal via bus. While deplaning onto the ramp is always a treat, it can take some time and busses can be cramped. However, this was the tradeoff for using de Gaulle instead of Orly Airport on the other side of Paris. 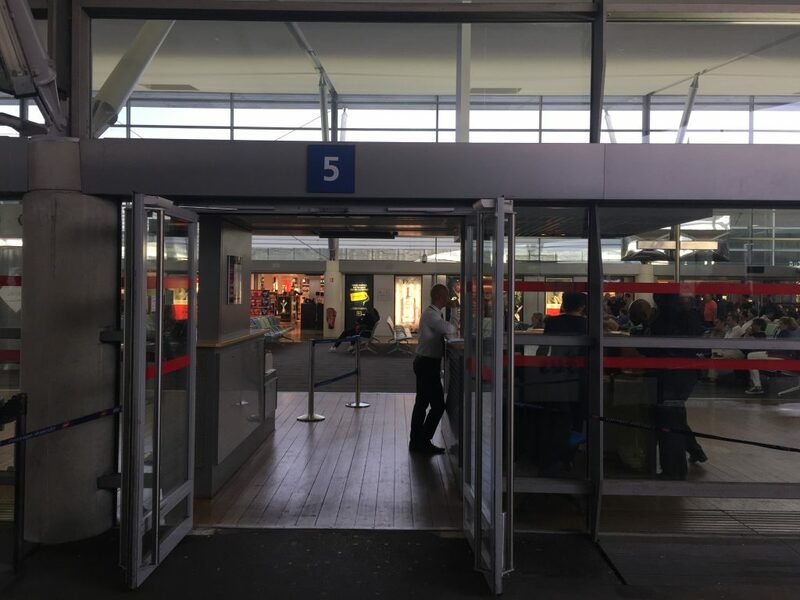 Clearing passport control and customs took no more than 10 minutes, despite the fact that Terminal 3 has no separate facilities for EU passport holders such as automated gates. After around 7-hours in the seat from boarding in Newark to deplaning in Paris, I could say that I was very comfortable throughout and the seat was the most surprising feature. At 30 inches of pitch, I was expecting to be crammed in. That couldn’t be farther from the case. The design of the seat allowed for ample legroom and my legs never touched the seat in front of me. The only problem with the seat was the lack of a headrest. The crew was very friendly and the service was timely enough for only having 4 flight attendants serving nearly 200 people. Having a USB outlet at the seat was definitely a huge plus. I pack a portable charger on every trip but it’s great arriving at your destination with a fully charged phone and portable charger, especially when most of the trip comprises of outdoor sightseeing. Obviously, low-cost airlines rely on ancillary fares and additional revenue streams to keep fares low and attract more passengers. However, I felt that I was constantly being sold something. Major airlines that I’ve flown on that charge for drinks and snacks, as well as sell items on board, are usually more discreet. Although its easy enough to ignore, being reminded via PA system when you’re trying to sleep or relax can be annoying. Would I take this flight again in economy? Absolutely. 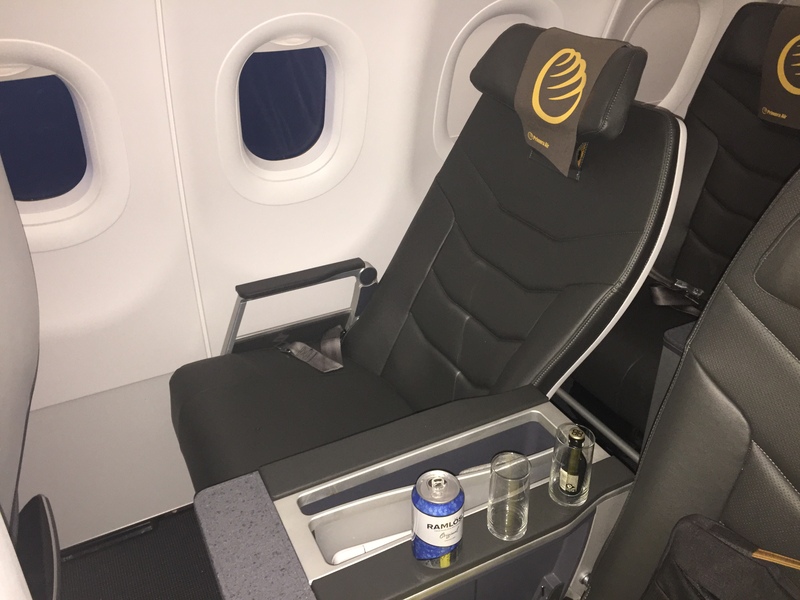 On the 9-hour flight back to Newark, I was able to test out Primera’s premium product, the low-cost equivalent of international business class. 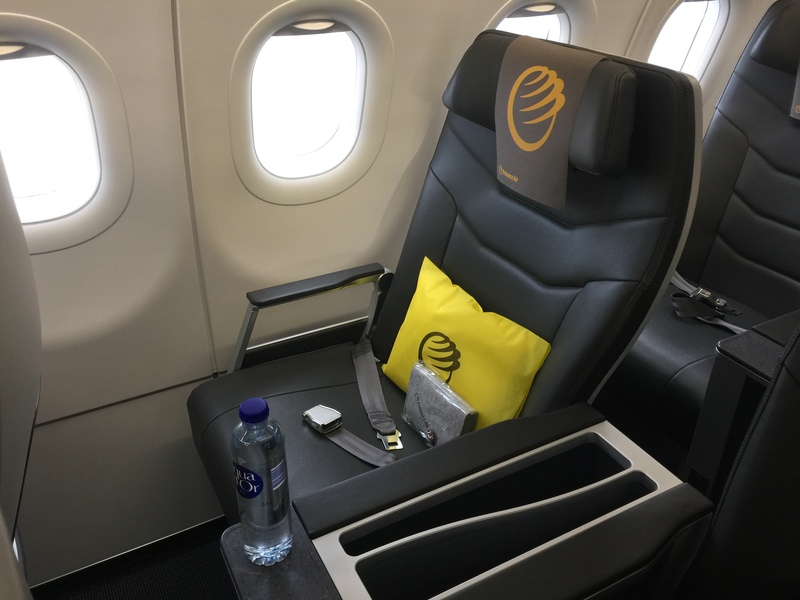 Prior to this flight, I had already tested Norwegian’s premium product on the Boeing 787 Dreamliner and WOW air’s bigseat product on the A321, which would form the basis of what I would compare Primera’s product to. 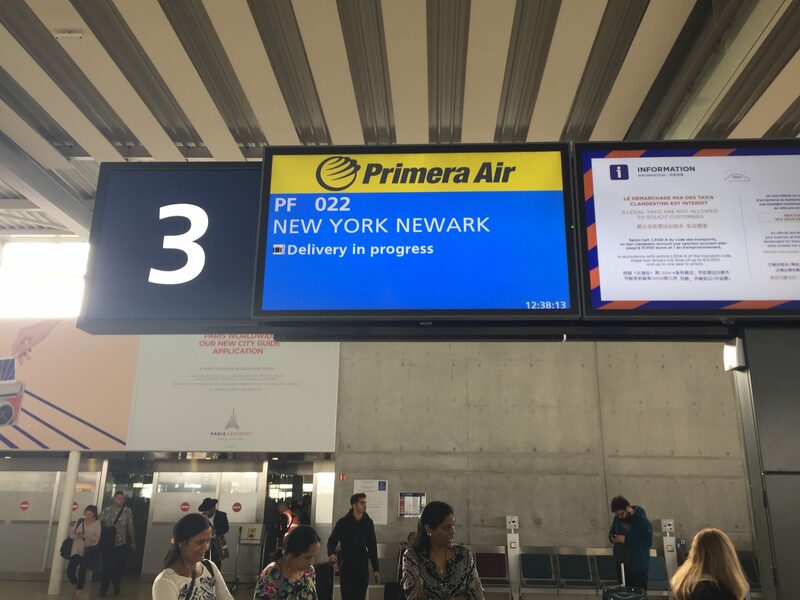 Again, as Primera only has one daily flight between Paris and Newark, I was booked on PF21, departing Paris Charles de Gaulle at 6:50 p.m. and arriving at Newark Liberty International Airport at 9:45 p.m. following a 9+ hour flight. This is also the third longest flight in Primera’s current network, following Paris-Toronto and London-Washington, due to headwinds, and the longest flight I’ve been on in an A321. 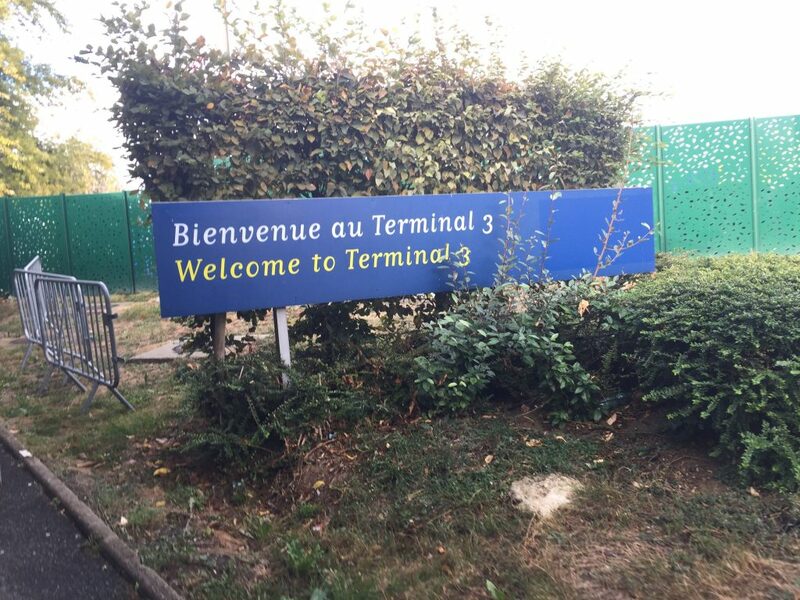 While I had only spent a few minutes in Charles de Gaulle’s Terminal 3, I liked the fact that it was small and compact, meaning no long walks and, hopefully, no long lines come departure. 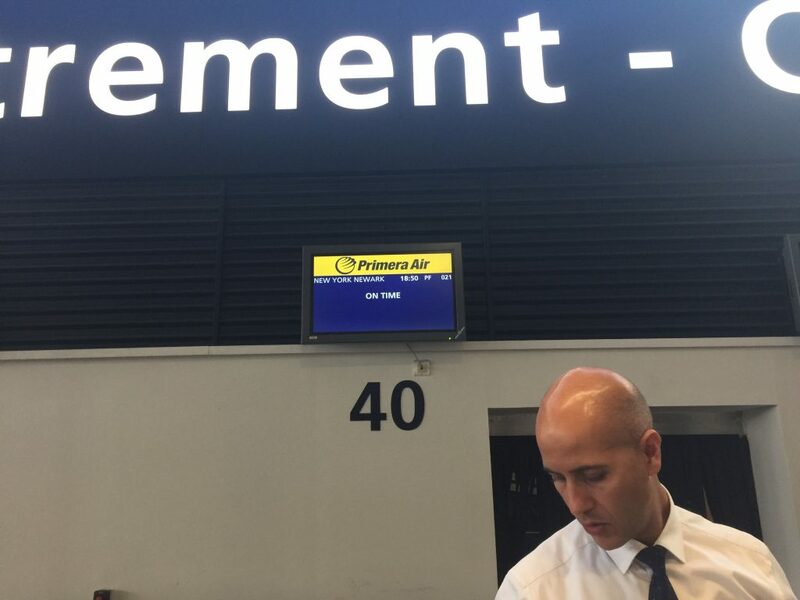 After arriving late to the airport due to a Paris mass transit issue, I was overwhelmingly happy that Primera’s check-in agents remained open even up to an hour before the flight. While check-in was a breeze, only requiring a quick weighing of the luggage, passport control was unnecessarily difficult. The terminal doesn’t operate any EU automated facilities on the departure end either, increasing lines for all. Even with the long line, I was able to get clear in around 20 minutes. The good thing is that when you clear passport control, the gates are only feet away. The downside, you have to wait for your bus to fill up before heading over to the plane, a bus with very few seats. 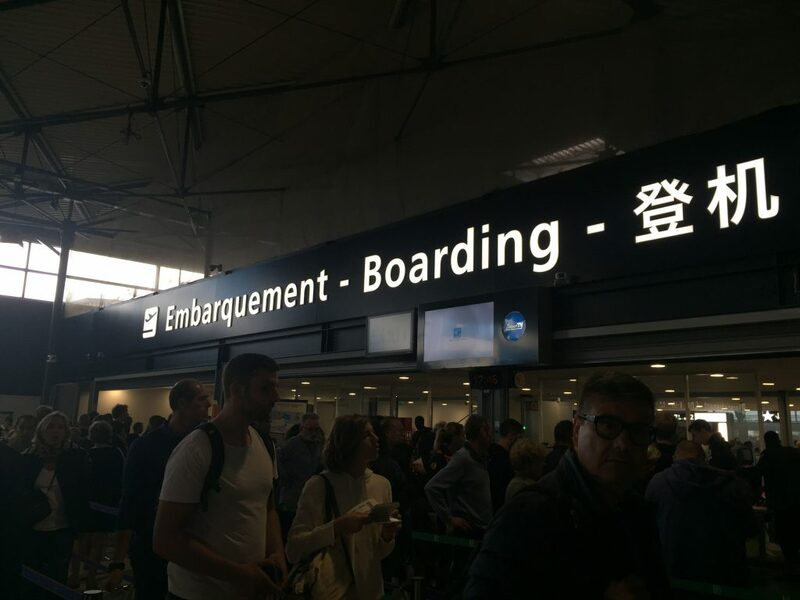 Boarding from the ramp, however, is still one of the best experiences you can have, especially at an airport like de Gaulle and when you’re last to board. Our aircraft was adjacent from the French government’s Airbus A340-300 and an Air France Concorde display. Walking up the stairs during the golden hour just before sunset, I was able to turn around and say goodbye to Paris before boarding the white, grey and yellow Airbus A321neo that would become my home for the next 9-hours. In the weeks leading up to the flight, I frequently looked at the seat map for the premium cabin and saw that there were very few people booked in it, maybe two other people besides myself. However, this is par for the course since low-costs typically offer discounted upgrades at check-in or even on the plane and business travelers don’t typically fly this kind of route on weekends. It wasn’t until boarding the plane that I saw that number had increased to 4, not including myself. Since the cabin is 4 rows long in a 2-2 configuration totaling 16 seats, it gave it an empty and exclusive feel. 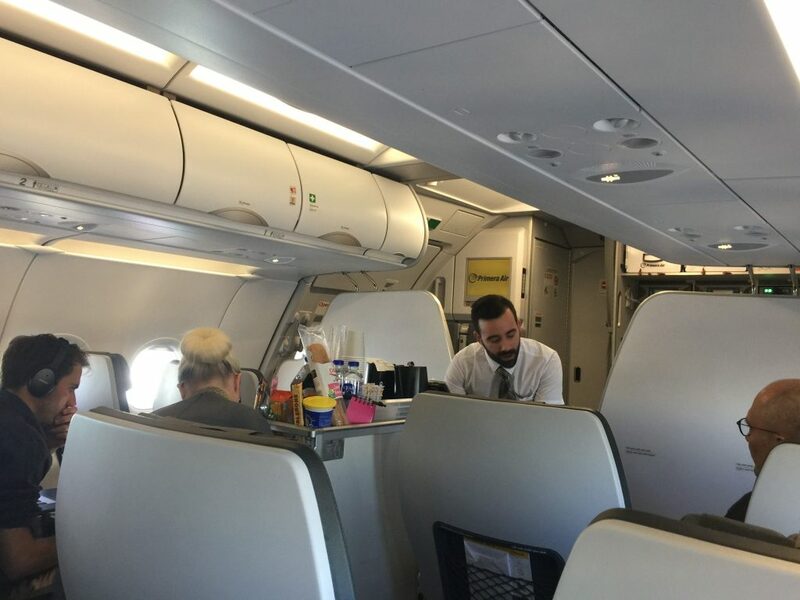 Due to the empty seats, the crew offered an upgrade to economy passengers for about 100 euros around 2-hours into the flight. 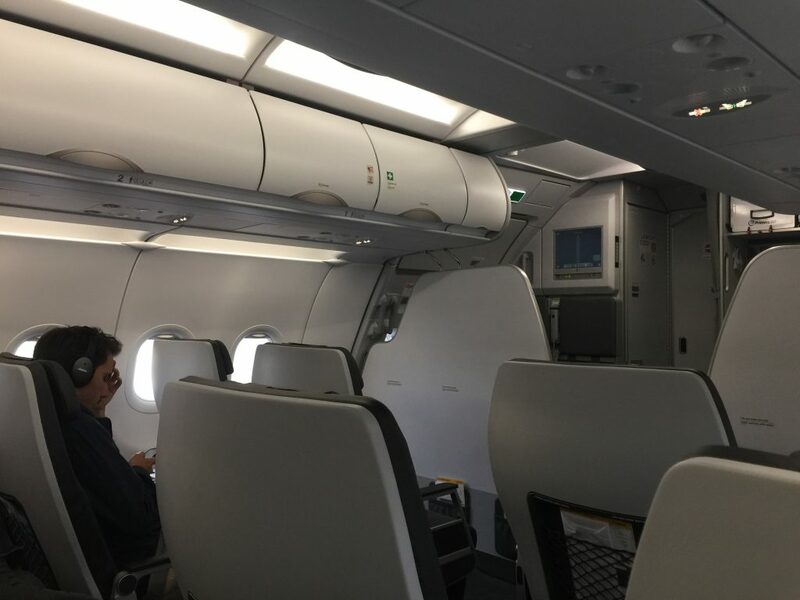 I had gotten a glimpse of the cabin on the flight to Paris, on which more premium seats were occupied, and was excited to try it because it was a unique hybrid product with an interesting mix of features and amenities. 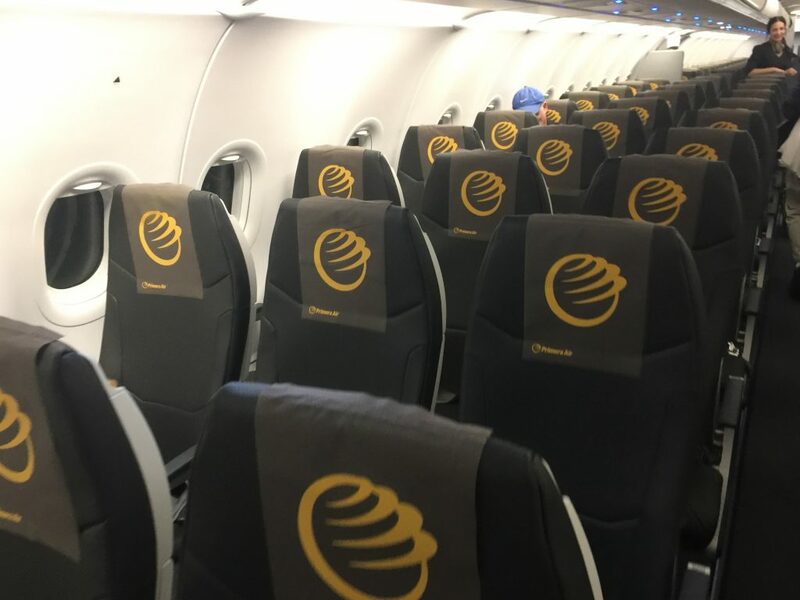 The premium fare is one of the most flexible and inclusive, offering a free checked bag, a carry-on, a complimentary meal, snacks, unlimited drinks (including alcohol), priority boarding and an advanced seat assignment. Premium passengers also have a dedicated check-in line. One of the key features that it doesn’t offer, however, is lounge access. 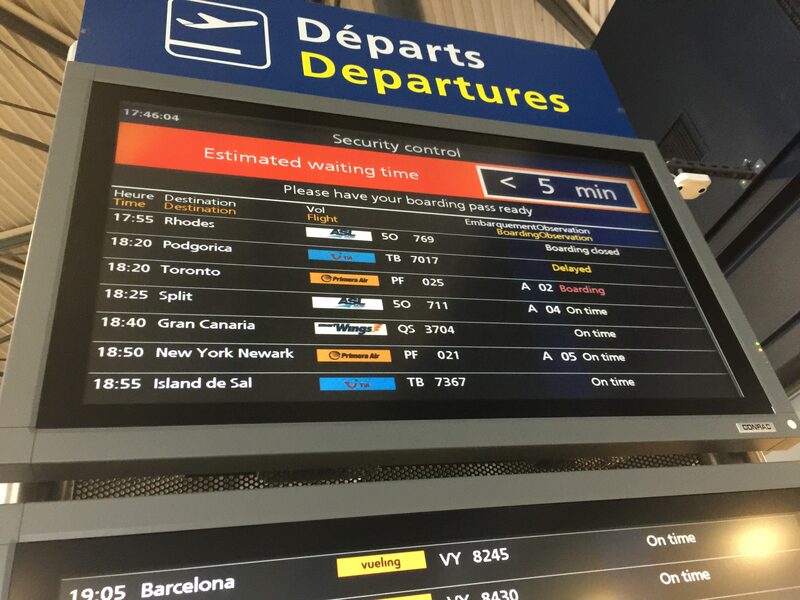 Although there is no lounge to offer at Charles de Gaulle’s Terminal 3, most of the airports Primera serves and will serve have lounges that would be very effective before a transatlantic flight, which Norwegian gives its premium passengers. However, the onboard amenities certainly made up for the lack of a lounge. Onboard, there is no real divider between economy and premium, with a half curtain taking the place of a dividing wall, common on European airlines. 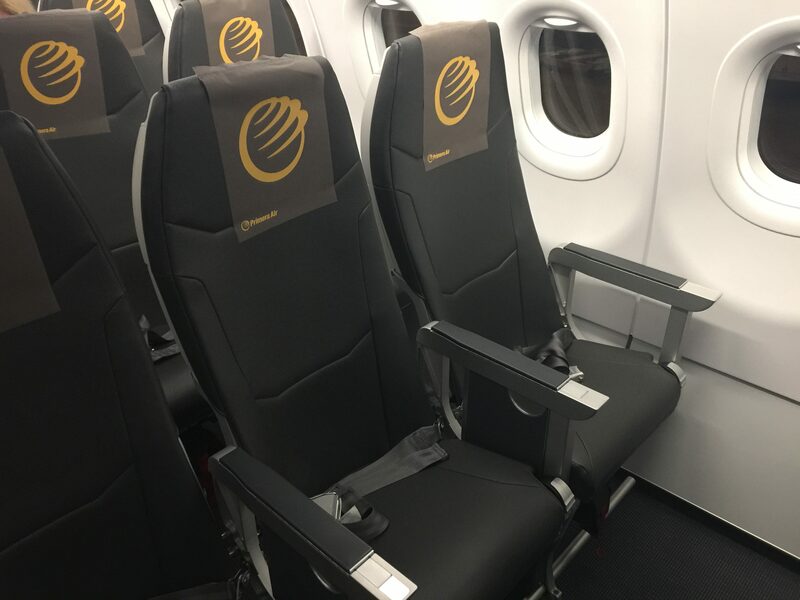 Unlike WOW air’s bigseat product, these seats are solely for paying premium passengers. Although seats are randomly assigned on Primera if you don’t purchase one in advance, you cannot be placed in this seat at random. While this limits the potential revenue the airline can make, since its blocking off 16 seats with no guarantee anybody will sit there, it gives the cabin some exclusivity, similar to Norwegian’s premium product. The non-exclusivity of the cabin in relation to the rest of the plane with no dividers or curtain makes the cabin feel crowded at some points with economy passengers using the forward lavatory, open to all. This can be bothersome if trying to sleep and people are coming up and down the aisle to use the lavatory. Also, there’s a half wall separating the galley from the cabin, which can be bothersome if the crew is working and/or talking. I chose seat 3F for the flight for no apparent reason other than its centrally located in the cabin. 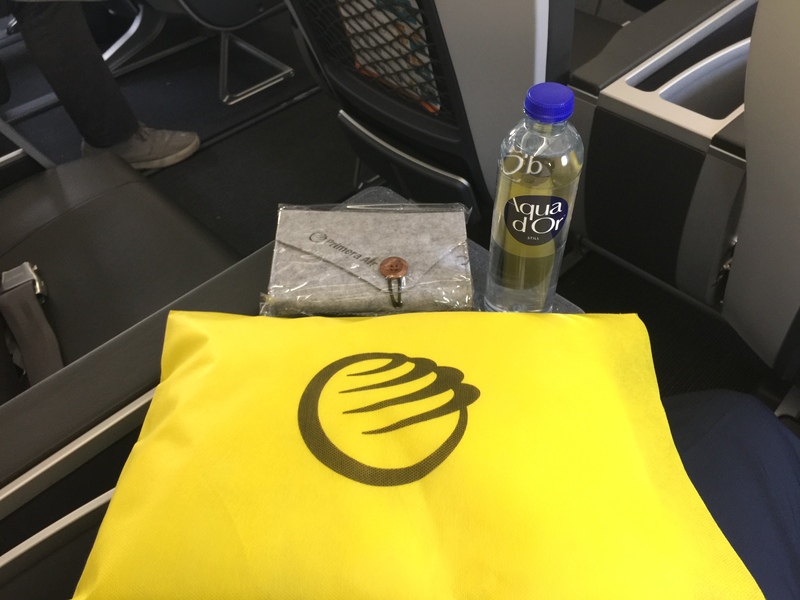 When I arrived at the seat, there was a pillow and an amenity kit waiting, as well as a water bottle which I promptly drank. There was no blanket, but the flight attendant informed me that was the result of a problem with the catering company and that there are normally blankets on board. Inside the amenity kit were the standard items you’d expect to find on a major carrier, a toothbrush with toothpaste, earplugs, a sleeping mask socks, a comb, as well as items you wouldn’t expect to find such as hand cream and a shoe horn. 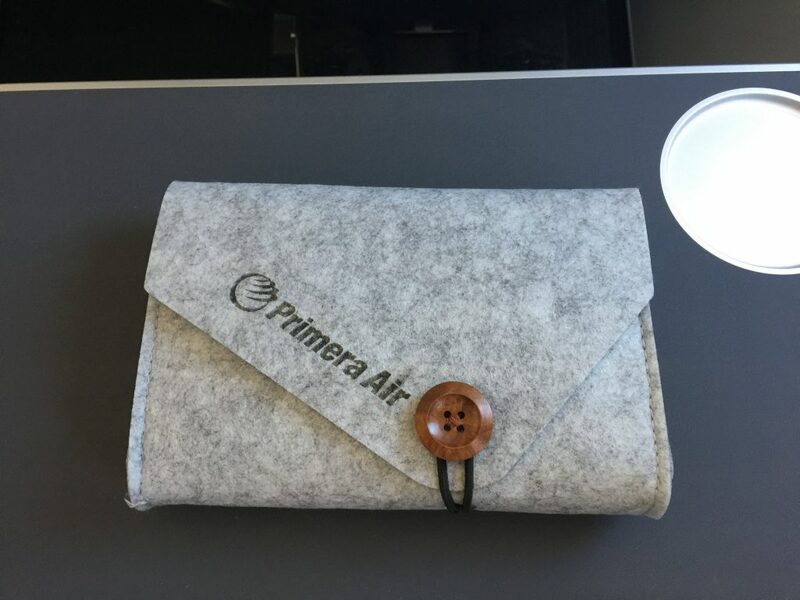 I was surprised that Primera even offered an amenity kit, giving it a plus above Norwegian and WOW. Sitting in the seat, I could tell it was basically a slimline version of a domestic business class seat. The seat pitch, width and recline were very generous, giving a larger fellow like myself enough room to stretch out comfortably, but the padding on the seat was very scarce, with Norwegian and WOW’s premium seats offering more cushioning. The seat did, however, have a headrest, which was a nice addition compared to the headrest-less economy seats. Facing forward in the seat, your view consisted of a bare seatback. 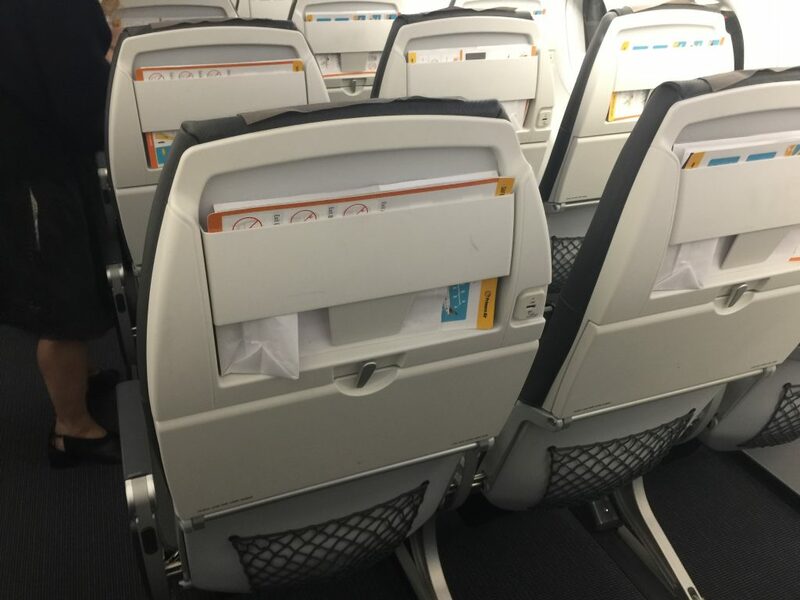 Besides the seatback pocket, the seatback of the seat in front of you offered nothing. Mirroring my thoughts from the economy seat, at least a device holder would be beneficial since there’s no entertainment offered. 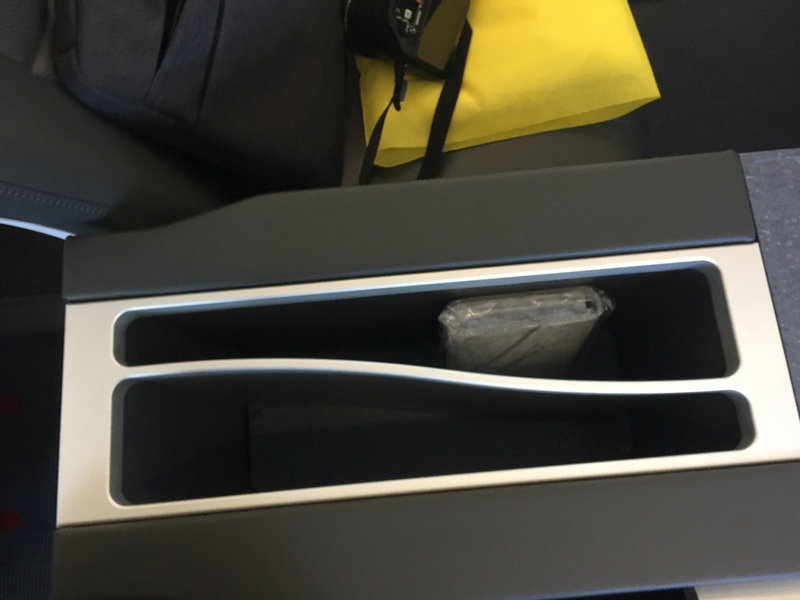 The seat did offer an upgraded power outlet with both USB and 3-prong plugins for each seat conveniently located in the front of the center console compatible with U.S. and European plugs. The dividing center console was also larger than others I’ve experienced on both major airlines and low-costs alike. In front, a marble-esque slab served as the drink area and in the middle down to the back, two uncovered storage compartments each almost shaped like the island of Manhattan provided well-needed storage space, perfect for even a large laptop. I kept my laptop, amenity kit, passport and wallet here during the flight so they were easily accessible. Similar to an international premium economy seat, it would seem difficult to get into the aisle if you are in the window seat and the person in front of you is reclined. 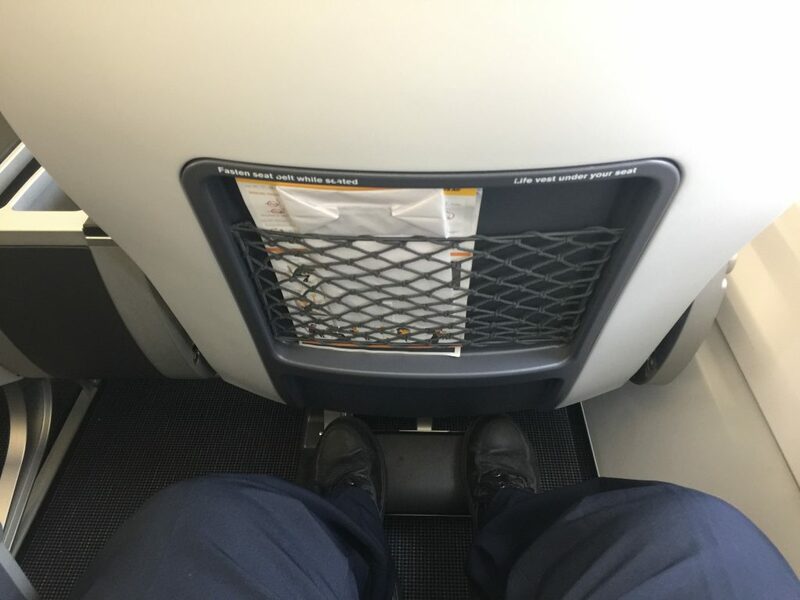 I didn’t have anybody seated next to me or in front of me, so I didn’t deal with this particular problem, but I have experienced it before in premium economy on major carriers. 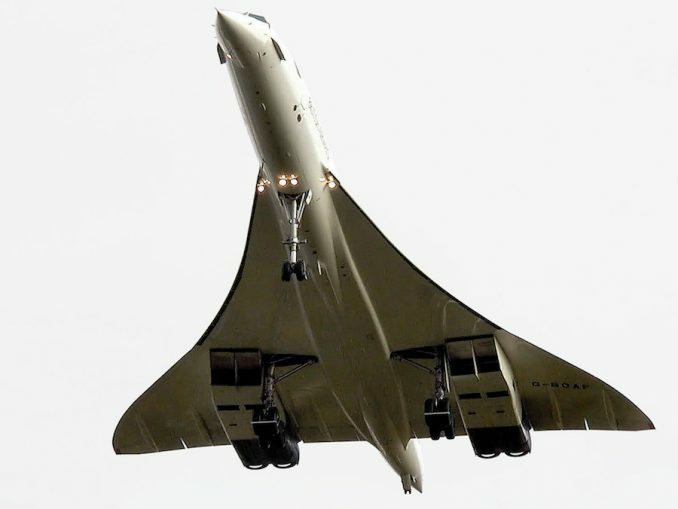 The food and drink service for the flight began 45 minutes after wheels up from Charles de Gaulle. Since there are only 4 flight attendants and no dedicated premium flight attendant, the tasks pile up quickly. 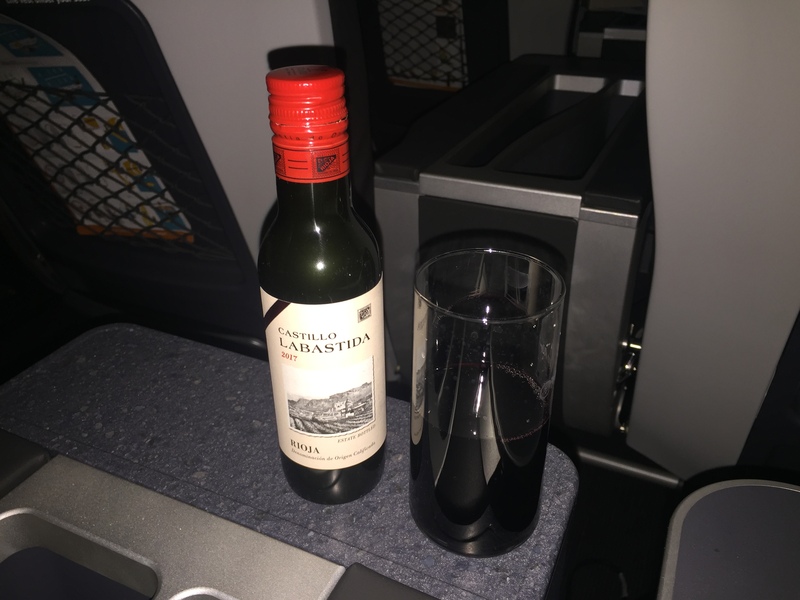 Snack and beverage service came first, with premium passengers being invited to select a beverage and snack. 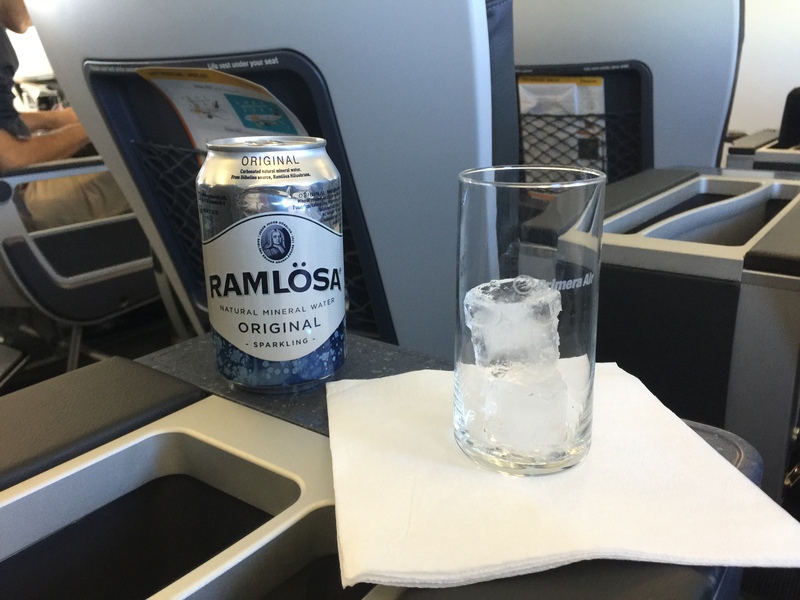 Unlike Norwegian and WOW, the snack and beverage cart came through multiple times throughout the flight. If you wanted to purchase something in between, however, you’d have to pay. 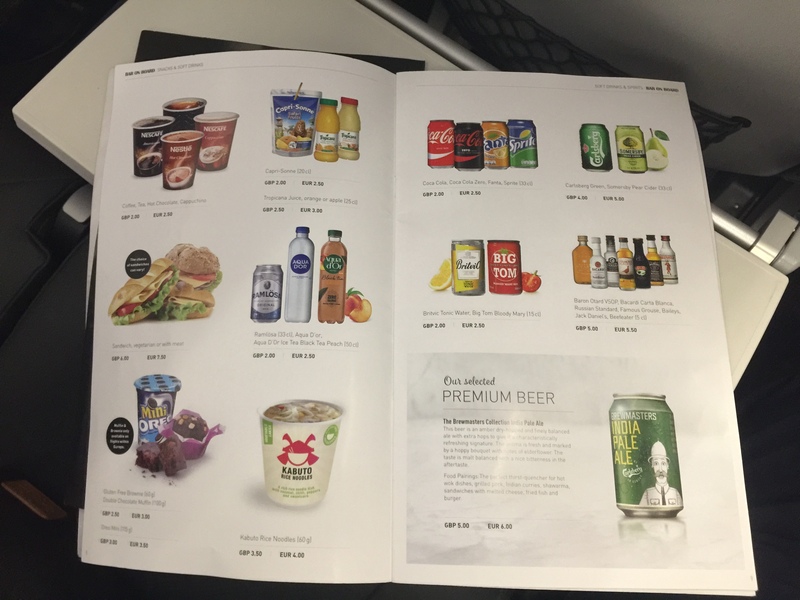 Beverages, even alcoholic beverages, are unlimited, complimentary and served in a Primera Air branded glass. This is in contrast to some other low-costs which only offer complimentary alcoholic beverages at meals times and charging at other times. Once the snack and beverage service was completed for the entire aircraft, two flight attendants began the main meal service for the premium cabin while economy was served their meals. I received my pre-ordered meal 1 hour and 20 minutes after wheels up from de Gaulle. You pre-select your meal on Primera’s website before the flight, so you know what to expect, the options are generally chicken, beef or fish, but it doesn’t get more specific than that. Here’s where Primera takes the cake over the other low-cost premium products, a 4-course meal served in actual plates and dishes. The tray of food consisted of a small appetizer, the entrée, a dessert and fruit and cheese. As I had the beef meal, my meal consisted of a cold antipasto, beef tenderloin with potatoes and string beans, a pineapple cake and grapes with brie and swiss cheese, as well as a dinner roll with butter. The meal was absolutely delicious and was not what I expected from a low-cost carrier. On Norwegian, the meals were served in boxes and although very tasty, did not come with the same presentation as Primera. The only downside to the meal was there was no salt and pepper offered, and the cutlery was plastic. Other than that, no complaints, or leftovers, from me. Once dinner was cleared, the lights were dimmed and downtime began. Although I gently drifted off to sleep, the crew was still working very hard. Later during the flight, the extremely attentive crew came by multiple times to see if we needed anything and were always happy to refill a drink or take away trash if needed. I believe they finally took their break just before the halfway point in the flight. 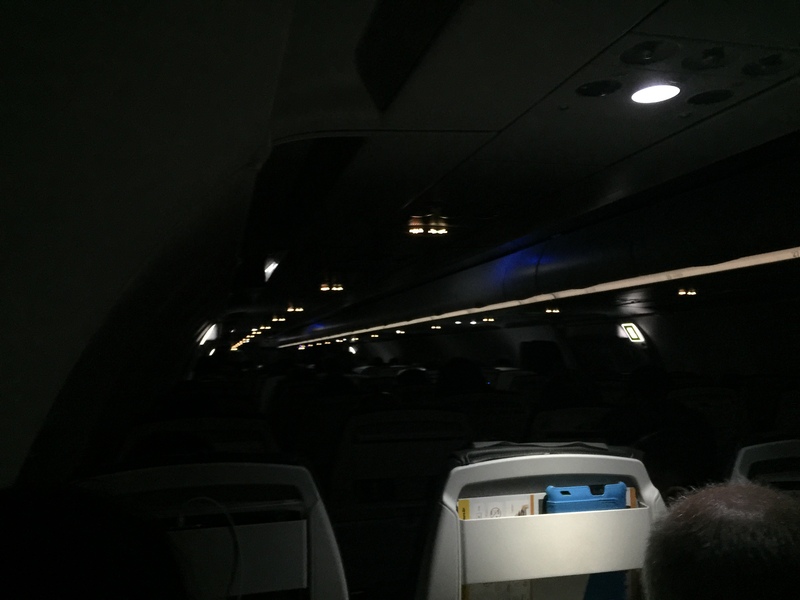 One complaint was that the cabin lights were left on unnecessarily throughout the flight. On a long flight like this where sleep is absolutely paramount, dimming the lights is a necessity. Although Primera provided sleep masks in premium, economy passengers didn’t have that luxury. Dimmed lights also provided a more relaxed cabin atmosphere conducive to sleep. 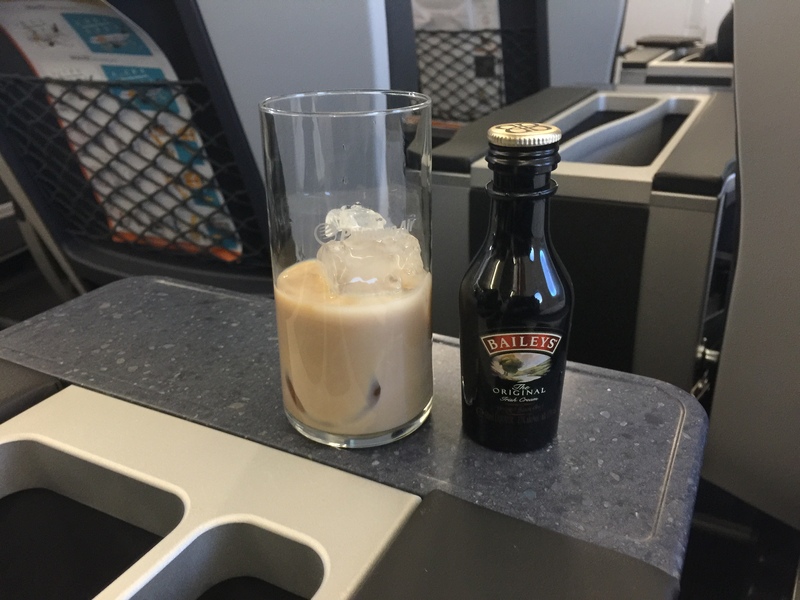 3 hours before landing, the crew came around again with the snack and drink service. This would be the second to last service before landing in Newark. I had read in previous reviews that a before-landing snack would be offered, such as cheese and crackers, but none was offered, only the snacks and drinks from the cart. The last service was an hour and a half before landing. While the multiple services are appreciated, the final service should be no more than an hour from landing, especially on a long-haul. We landed around 20 minutes late due to air traffic control routings and quickly taxied to the gate, where I was curbside in less than 5 minutes thanks to Global Entry, the hard-working U.S. Customs and Border Protection folks and the fact that the small size of Primera’s A321 give it access to the gates closest to customs. 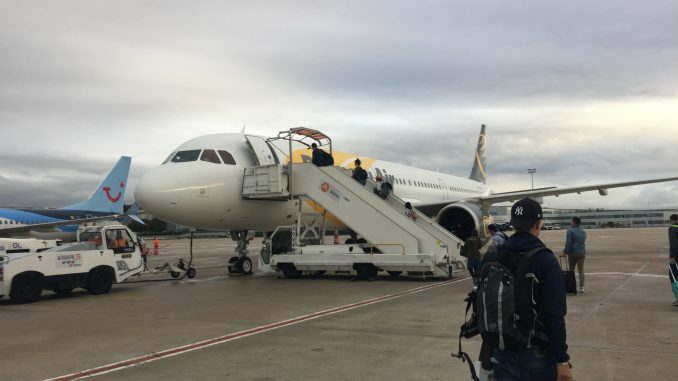 Arriving curbside, my trip to Paris on Primera Air had officially ended. Although a late entry into the game, starting service just this year after Norwegian, WOW and LEVEL had established themselves in the market, Primera surely doesn’t rank last. 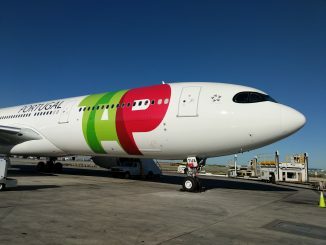 Despite initial operating hiccups, the airline has shown itself to be a worthy competitor in the low-cost transatlantic market, judging both from my personal experience with the service and the load factors on its flights. On both of my flights, the load factors were well above 85 percent, if not 90 percent. 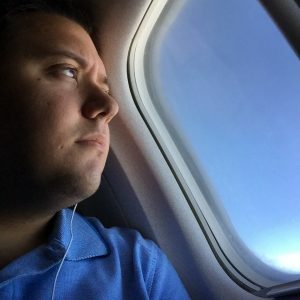 Although anecdotal, my experience on Primera and the load factors I’ve witnesses goes along with what the data from the airline has been showing. In economy, Primera offers a variety of choices greater than those on other low-costs, namely the choice in seat pitch and legroom. Instead of a set pitch throughout the aircraft, Primera offers different choices. Even if you choose not to purchase a 32-inch pitch seat, there’s a chance you’ll be randomly assigned one at check-in, and from my experience, the 30-inch pitch seats felt a lot bigger. Seat-wise, Primera’s seats are less padded than others I’ve experienced, but it didn’t affect my flight in the least. The lack of a headrest or extra padding in that area may be an issue for the longer flights, however, so I’d advise bringing a pillow. 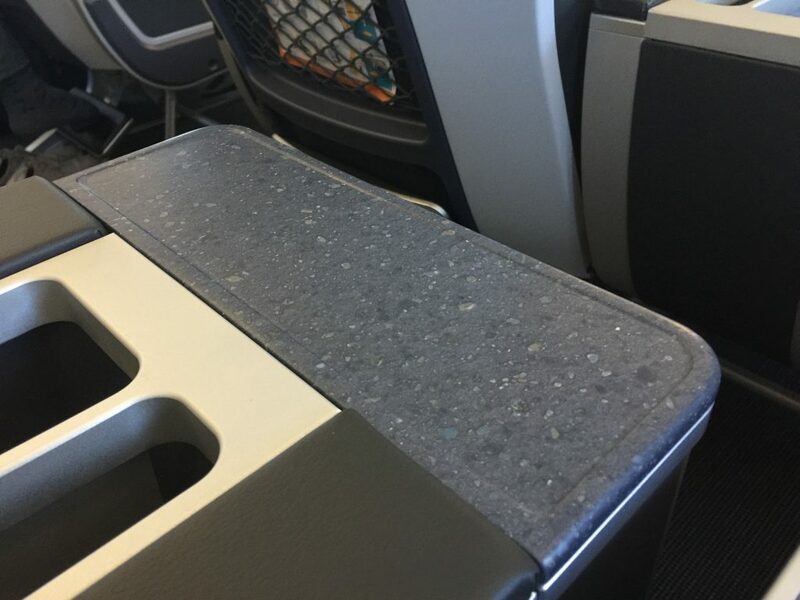 However, offering a USB outlet at every seat is a great addition that helps with the lack of entertainment. 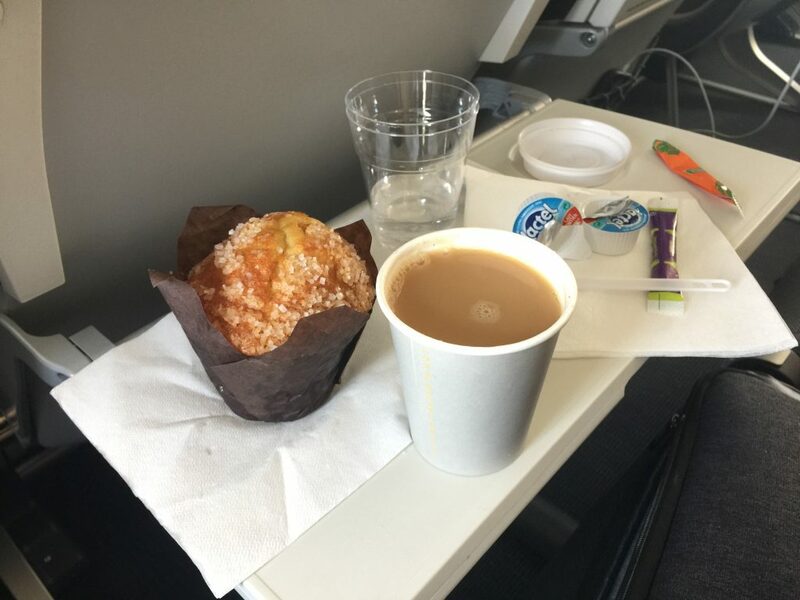 While the service in economy was more or less the same as other low-costs, the offering of complimentary water, coffee and tea is more than some, as WOW doesn’t offer complimentary water and coffee and tea is usually a chargeable item. Additionally, the service was truly top-notch, as the flight attendants came over and asked if they could get me anything after I woke up. In terms of entertainment, I’d like to see the airline do more. Even though most airlines, including majors, are moving away from in-flight entertainment systems, Norwegian offers in-seat IFEs on its 787s, LEVEL offers in-seat IFEs on its Airbus A330s and WOW air offers an iPad to rent during the flight. For low-costs, boredom is the worst enemy and while bringing your own entertainment solves that problem, providing an alternative is always good. 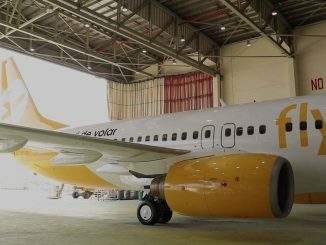 Primera, however, is in line with Norwegian’s entertainment-less Boeing 737 MAX 8s. Primera’s premium was very impressive for a low-cost airline. The only downsides to the product were the lack of padding on the seats, open access to the cabin and a lack of lounge access. However, the seat truly did rival an international premium economy on a major carrier. The highlight of the product was the meal and drink service and attentive cabin crew. This was the only low-cost premium service to offer an amenity kit, free-flowing drinks and a meal service with actual flatware and a 4-course meal that I was incredibly impressed by. While premium economy products don’t typically offer lounge access, Primera should look to match Norwegian in this regard to enhance the overall travel experience, since transatlantic flight in a premium cabin is typically deserving of such an amenity. Having tried Norwegian, WOW and Primera’s premium products, I can safely rank Primera as the best out of the three for the onboard experience. In my opinion, Norwegian gives the most amenities, but offboard amenities don’t help pass the time on a 9-hour flight and a proper meal, free-flowing drinks and complimentary snacks make up for the lack of lounge access and IFE considering the pervasiveness of personal entertainment. Often times, I hear that aircraft such as the Airbus A321 and Boeing 737 are too small for transatlantic flight and those aware of what aircraft they are flying on will choose an alternative aircraft type. However, based on the load factors I’ve seen and that Primera has reported, as well as the performance characteristics of the aircraft, I believe it’s the right aircraft for the job. 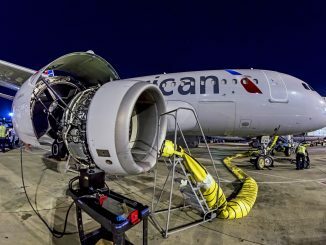 Additionally, the reduced engine noise of the A321neos engines make the ride quieter. Flying on some of the airline’s longest routes on the Airbus A321neo, I didn’t feel any different than if I was flying on a Boeing 777. 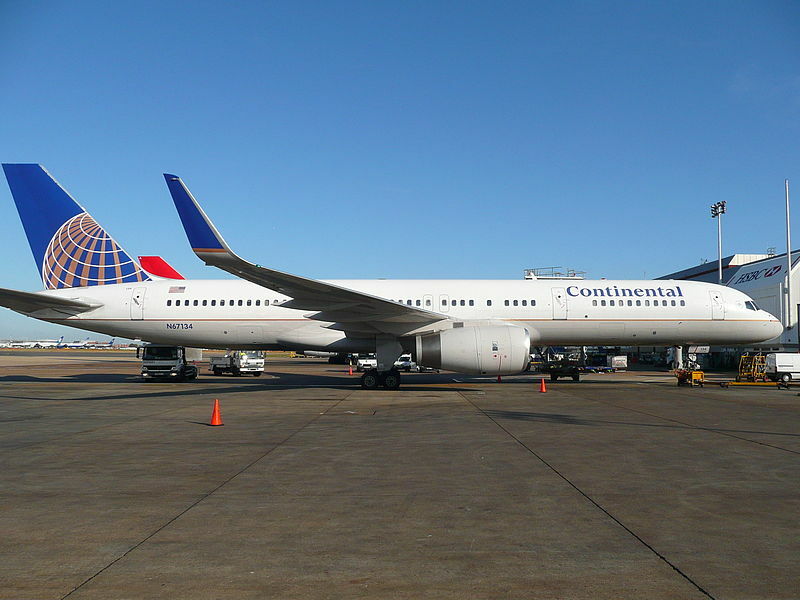 The 3-3 configuration is no different than the 3-4-3 configuration found on many of the 777s found flying today or the 3-3-3 configuration of a Boeing 787 and the single-aisle doesn’t really make a difference. I get that mentally, being on a larger aircraft may make you feel that you have more space, but all things considered, it’s no different. While larger widebody aircraft normally fly with crews of 10+ people on aircraft equipped with crew rest areas, Primera’s A321neos don’t have either. On both flights, the 4-person cabin crew and 2 man flight crew were all that we got for the treks across the Atlantic. 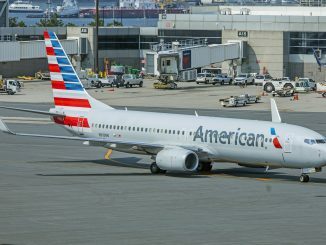 Although I initially recognized the impact that a 4-person crew has on an international flight of nearly-200 people that sells/serves meals in addition to drinks, snacks and other items, I saw firsthand how hardworking the crew was on the flight home in premium due to my proximity to the forward galley. In all honesty, besides what seemed like a short break in the middle of the flight, the cabin crew was constantly on their feet serving passengers. On the westbound flights, the crew is working 10+ hour days without a crew rest or relief crew and still managed to maintain the same level of professionalism and service throughout. The crew is part of what makes these flights enjoyable. Seeing them persevere with a smile on their face and constantly working makes what we do as passengers seem negligible by comparison. While I’ve never had a problem with any of the low-cost crews I’ve flown with, Primera’s deal with a unique set of circumstances working flights around 9-hours long and serving a two-class cabin with multiple services throughout the flight. 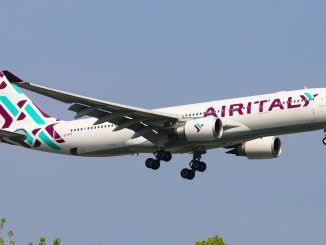 It’s no secret that Primera had a rough start beginning with wet-leasing Boeing 757-200 and Boeing 767-300ER aircraft from National Airlines and Euro Atlantic Airways, respectively, due to the delayed arrival of its Airbus A321neos and that the airline still struggles with delays and cancellations. 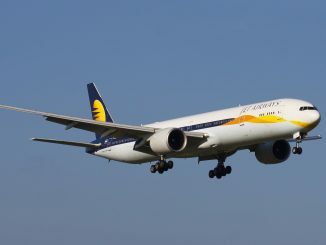 However, going mainly from my experience with the airline, I thoroughly enjoyed the product that they offer and once they straighten out their operations, will be successful in this market. Clearly, the airline learned from its rivals on what to do and what not to do, what to offer and what not to offer, etc, and has formed a solid hybrid airline. Once the rest of its aircraft arrive and the airline starts getting its groove, I have no doubt that they’ll be a major player in the market. And take it from me, if you’re skeptical about giving them a try, the destination is more than worth it in the end, as I found in Paris. 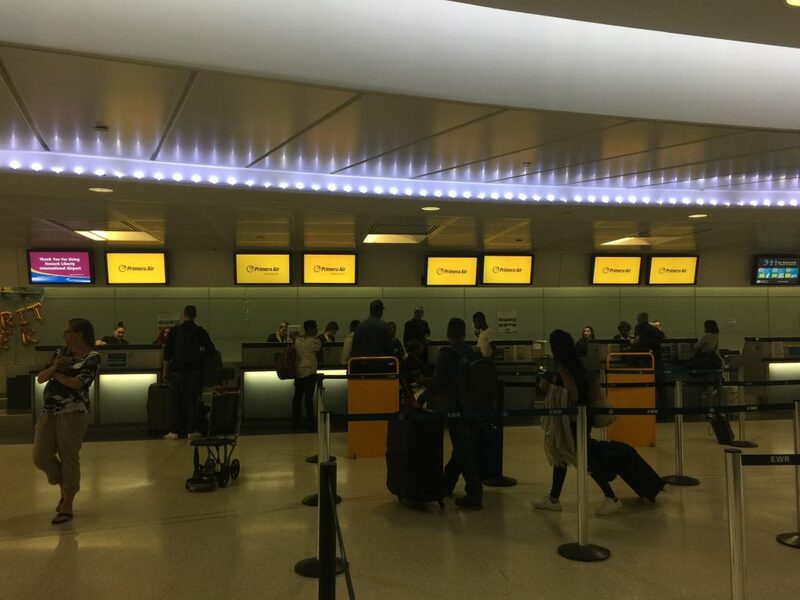 The writer flew to Paris as a guest of Primera Air. Tom has been flying for as long as he can remember. His first flight memory was on a Song Airlines 757 flying from LaGuardia to Orlando. Back then, he was afraid to fly because he thought you needed to jump off the plane in order to get off. Some years later, Tom is now a seasoned traveler, often flying to places just for the fun of it. Most of the time, he'll never leave the airport on his trips. If he's not at home or at work as a Line Service Technician at Long Island MacArthur Airport, he's off flying somewhere, but only for the day.